Sautéed leeks add a nice level of sweetness to the chowder and are a good source of vitamin C.
1. Place the salmon in a frying pan, cover with milk, stock and thyme and bring to the boil for 2-4 minutes, then cool. 2. Spray a large pan with oil and cook the leeks until softened. 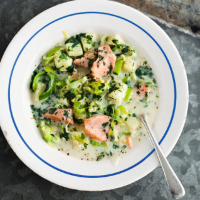 Lift the salmon out and pour the cooking liquid into the pan of leeks. Add the potato and lentils and cook for 30 minutes. Flake the fish and stir into the chowder along with the parsley.